The 11th edition of the premier women’s football competition in Oceania is upon us and for all 11 participating nations the path to the FIFA Women’s World Cup 2019 and the Women’s Olympic Football Tournament Tokyo 2020 has been laid out. 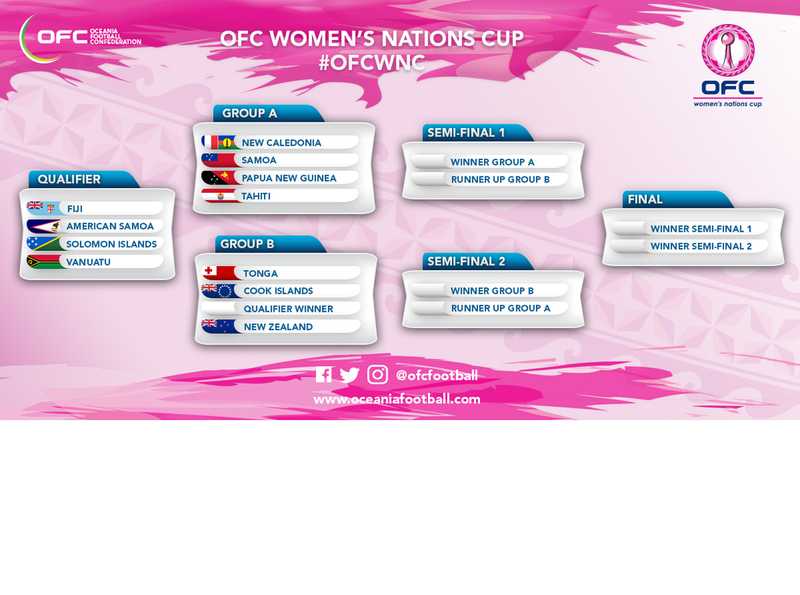 The official draw for the OFC Women’s Nations Cup was held at the OFC Headquarters in Auckland, New Zealand revealing the journey from the Qualifiers in Fiji all the way through to the final which will be held in New Caledonia on 1 December 2018. The first stage of the competition kicks off in August when Fiji, American Samoa and Vanuatu meet for the final available position in the Group Stage. The winner will go on to join Tonga, Cook Islands and defending champions New Zealand in Group B. Making up Group A are hosts New Caledonia, Samoa, Papua New Guinea and Tahiti. Only four OFC Member Associations have hosted the OFC Women’s Nations Cup with this year’s edition making a return to New Caledonia for the first time since 1983, when the inaugural version of this competition was held – the OFC Women’s Championship. Since then it has passed between former OFC member Australia, New Zealand and most recently, Papua New Guinea. Although New Caledonia were not present in Kokopo for the tenth edition of the competition, they assembled a year later in Port Moresby for the XV Pacific Games where they finished up with a silver medal behind fellow Group B side Papua New Guinea. Papua New Guinea have held the gold medal in the Pacific Games ever since the women’s tournament was introduced in 2003, and they’ve also been runners-up in the OFC Women’s Nations Cup for the past two editions. Tahiti have never finished in the top three, and neither have Samoa. In Group A the hot favourites to earn a fifth Oceania champion’s title are New Zealand who boast a large majority of professional players among their squad. Although Cook Islands have finished third in the past two editions, and Tonga in the one before that in 2007, they are expected to struggle against the might of the Football Ferns. The OFC Women’s Nations Cup will be held from the 18 November to 1 December in New Caledonia. The winner of the competition will qualify directly to both the FIFA Women’s World Cup France 2019 and the Women’s Olympic Football Tournament Tokyo 2020.